Sometimes records are blessed with a destiny. They capture a perfect sound to enthral a listener fortunate enough to tap into its wavelength. 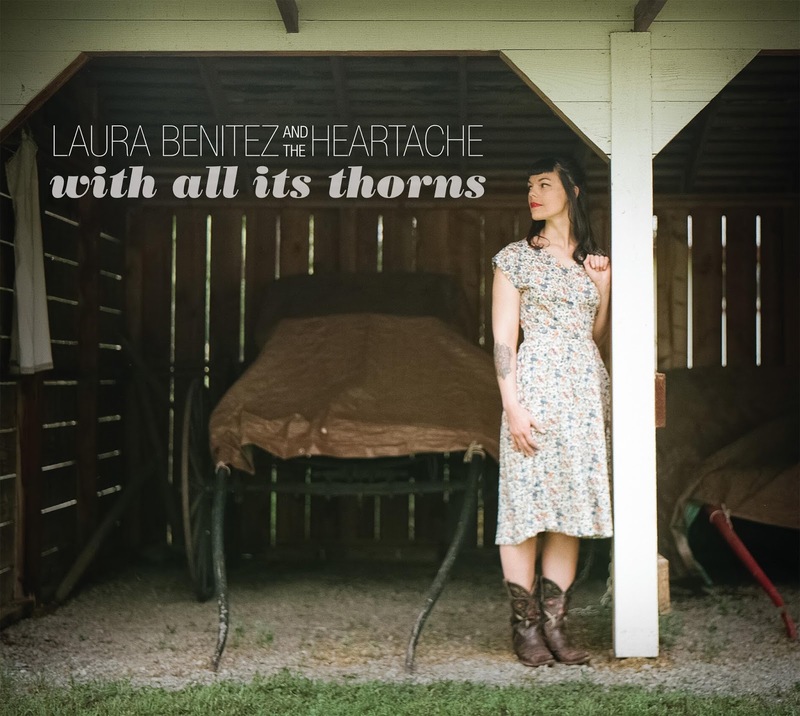 The fabric, dressing and substance of Laura Benitez’s third album hauls it into this category before unravelling as a timeless treat to fans who love a classic country sound laced with more than a hearty dose of fiery Latino sauce. WITH ALL ITS THORNS has put down a marker for an early instrumental delight of the year with lashings of luscious pedal steel sparring with border-inspired accordion, piercing your ear amongst a host of memorable tunes. Easy listening, maybe; absolutely adorable listening, certainly. Adding the word heartache to your band name is well on the path to adhering yourself with country tradition and as you submerge deeper into the album, the nod towards the Californian version becomes more apparent. Laura herself is steeped in the West Coast music scene and made the journey north from Los Angeles to her now base in the Bay Area. Distancing herself further away from her homeland’s southern border has done nothing to dilute the Hispanic influence and in addition to the frequent accordion, she drops into bi-lingual mode for the mid album number ‘Almost the Right One/Casi Mi Cielo’. If you so desire to be swept from a dusty saloon to a dusty cantina, your wish has been granted. While on the topic of vocals, Laura finds a higher plateau right from the off and puts on a scintillating performance as if judgment day is fast approaching. Any judgement on this album will be best placed to consider the exceptional opening and closing tracks. Repeatedly, the critical importance of a stunning opener has been preached and Laura firmly delivers here with the rapturously received ‘Something Better Than a Broken Heart’. Another essential trait of an outstanding release is to find the optimum length and leave the listener departing on a high. ‘Nora Went Down the Mountain’ is Laura’s delightful parting shot, and a prime piece of wanderlust storytelling, fully in the mode of the country-folk genre. Amidst all the obvious country leanings, the murder revenge ballad ‘In Red’ does wander very freely into folk music territory and perfectly captures Laura’s lyrical prowess to take a true story before weaving in some fantasy, hopefully! Storytelling does feature prominently in ‘Ghost Ship’, which is an account of a fire that happened recently in Oakland and had a considerable impact on that community’s arts scene. At this point, and in tracks like ‘Secrets’ and ‘Why Does it Matter’, the sound does climb down a little from the ravenous up tempo driving country floor fillers than herald the early stages of the record. ‘Easier Things to Do’ and ‘Our Remember Whens’ are the tracks responsible for maintaining the magnificent momentum of the opening. At this stage, you know you are in the presence of a fine bunch of players, with a plethora of sumptuous steel, accordion and guitar solos punctuating the valuable vocals. Heartache may well be their collective name and they certainly have the effect of spilling it out in their sound, alongside bouts of alternative feel good buoyancy. There are elements of the record with a distinctive familiar feel and ‘The Fool I Am Right Now’ falls into that category. No doubt, Laura has immersed herself into country history to develop this sound, so any apparent likeness is liable to be inherent. ‘Whiskey Makes You Love Me’ completes the eleven-track offering and what other subject content and connotation would you expect? WITH ALL ITS THORNS by Laura Benitez and the Heartache ultimately wins by putting a smile on the face of the listener. While the destiny is unknown, hanging onto the coat tails of its glorious journey is the place to be in the first month of the New Year. Simply an unrivalled piece of Hispanic drenched classic country.